Reed’s founding president, William T. Foster, was chosen by the board of trustees under the direction of Thomas Lamb Eliot, president of the board and a founder of Reed College. 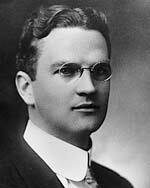 At 31 years old, having recently completed his doctorate at Columbia University with the progressive educator John Dewey, Foster was the youngest president in the nation. Throughout his presidency, Foster sought to implement the philosophy of teaching he had acquired at Harvard—where he had earned bachelor’s and master’s degrees in education—and which he had begun to develop at Bates College and Bowdoin, where, at the age of 26, he had been the youngest full professor in New England. Foster taught courses in oratory and debate at Reed, and was active in teaching extension courses that were open to the Portland public. During World War I, Foster instituted at Reed the nation’s first program (1918–20) to train female reconstruction aides for physical and occupational therapy in the military. His tenure was also marked by an interest in simplified spelling, a retooling of written English that relies on speech sounds—or phonetics—to regulate spelling. The Reed College Quest and the college yearbook both utilized simplified spelling in the early years. Foster and his family first lived in Hall A (Ladd dorm, Old Dorm Block), until the president’s house (Prexy) was built in 1915. The family lived in Prexy until Foster resigned the presidency in December 1919. Following his time at Reed, Foster worked extensively in economics to establish new theories regarding depressions and money flows. He published numerous economic works with his partner, Waddill Catchings. Foster died in 1950, at his home in Jaffrey, New Hampshire. A memorial service was held there, but his ashes were scattered over Reed Lake, on the Reed College campus.